If you have always yearned after a piece of topiary, shaped to perfection, yet don't want too much maintenance, then this is just the thing for you. 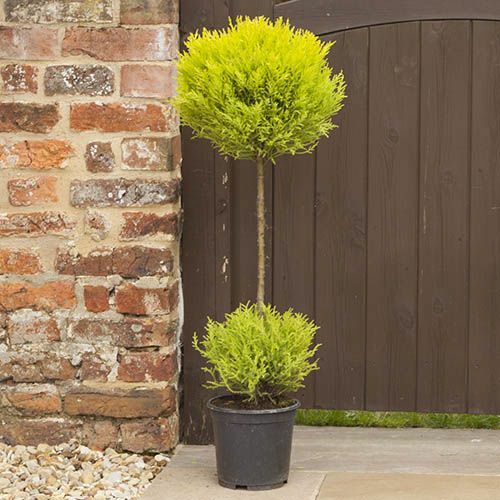 Clipped into two perfect spherical ball shapes, one on top of the pot and one atop a standard form stem reaching 90cm, they add a modern sense of shape and form, as well as year round acid lime yellow colour too! Striking for sure! They look fab as a single centrepiece plant in a small formal square bed, or in pairs in modern pots. Keep watered well in summer, they are hardy, and only need one trim a year in june time. Supplied as a 90cm specimen plant, trimed into two balls. Hardy, trim once per year in early summer.